Visual tagging designed to make the latest equipment status visible in industrial environments. Visual tagging designed to make the latest equipment status visible in a process environment. Visual tagging designed to help prevent working at height hazards. 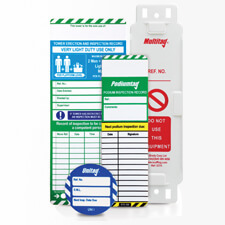 Visual tagging designed to make the latest status visible in areas of controlled access. Range of accessories that work alongside of our visual tagging solutions.